Wholly submerged, bottom-rooted, vigorous, aquatic perennial. Occurs in fresh water and can be up to 5 m tall in still water. One of the oxygen weeds, denser than Elodea and Lagarosiphon. Flowers White, conspicuously protruding just above surface, up to 20 mm in diameter. Flowers have three petals 4-12 mm long and nine golden stamens. Flowers occur in the axils of the upper leaves, two to three enclosed in a spathe. 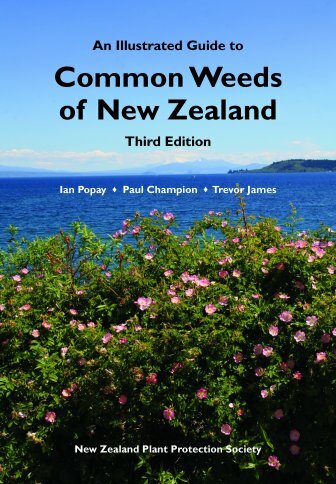 Only male flowers are found in NZ. Fruit Fruits not seen in NZ. Reproduction by regrowth from stem fragments. Leaves Very dark green, up to 4 cm long, in whorls of four to six. Leaves abruptly narrowed to a pointed tip. Stems Buoyant, slender, brittle, 3 mm in diameter. Stems up to 1 m or more long, much-branched, with nodes becoming closer together towards the stem tips. Still, shallow, enriched water in dams, ponds, drains, streams, rivers and lakes, in depths of up to 5 m.
Abundant in Waikato hydro lakes, scattered elsewhere in NI, and occasional, but spreading in SI. Originally from South America. Likely to spread to new waterways. Listed on the National Pest Plant Accord (see Introduction for details). 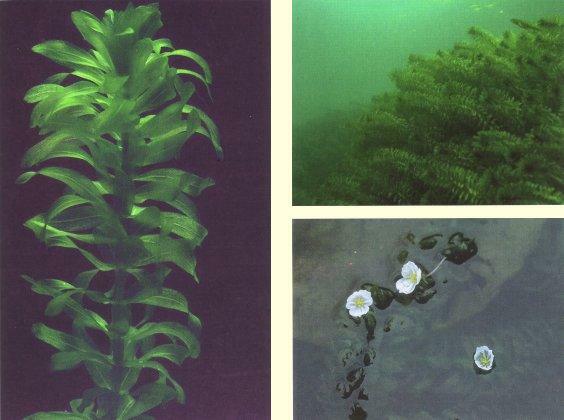 The oxygen weeds include Egeria, Elodea and Lagarosiphon. In Egeria the leaves are dark green, in whorls of four or five and 12-30 mm long. The flowers are white, conspicuous and emerge above the water. Egeria (Lat.) = after a Roman goddess of water; densa (Lat.) = dense.